What is Big Fish Fields? Big Fish Fields is a new horse racing game in Big Fish Casino. Big Fish Fields is only available on mobile devices (iOS and Android). Big Fish Fields becomes available at XP level 4. Virtually bet on your favorite horse(s) and watch the race to see if they win! Knowledge of horse racing isn’t needed – all horses are custom to Big Fish so simply place your virtual bet(s) and you’re good to go. 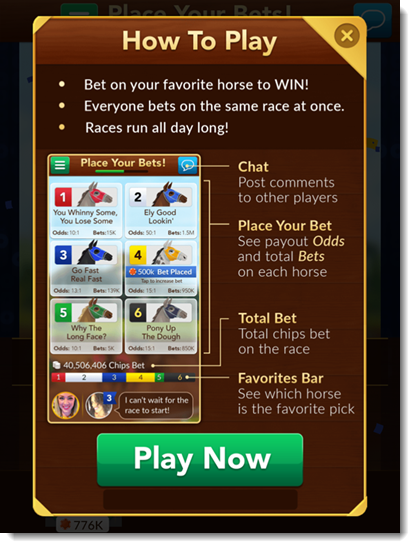 During the virtual betting phase, tap on a horse to go to the virtual betting screen. Choose your virtual bet for that specific horse along with the type of virtual bet, then tap Bet to Win to place your bet. Bet to Win – if that horse comes in 1st place and wins, you’ll win chips. Bet to Place – if that horse comes in 2nd place or better, you’ll win chips. Bet to Show – if that horse comes in 3rd place or better, you’ll win chips. The virtual payout odds for a particular horse depend on everyone’s bets for that round. 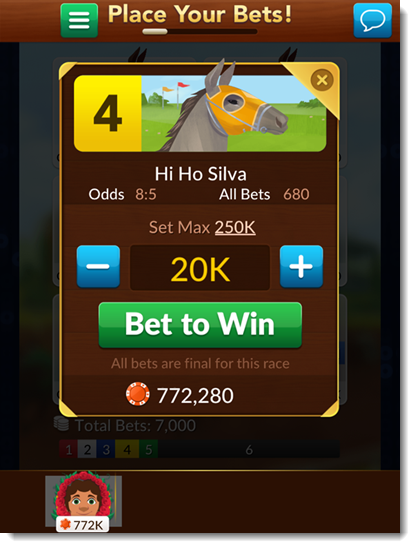 If there are more chips virtually bet on a particular horse, that horse will have smaller virtual payout odds if it wins while the remaining horses will have larger virtual payout odds if they win instead. 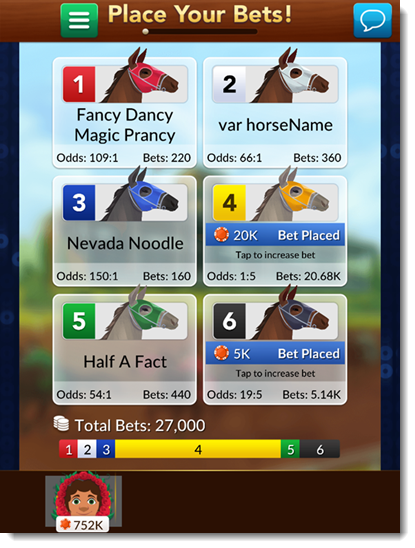 During the race, the virtual payout you can win for any horse you've virtually bet on will show up on the horse's information card. The amount is based on the virtual payout odds and the virtual bet type. Virtual bets can be made on multiple horses to increase your chances. Watch the race to see if your horse wins! Tap the chat button in the upper-right-hand corner to post comments that other players can see. Watch the space at the bottom of the screen for chat messages from other players. Tap other players’ icons as they scroll by to open up their profile or to send them gifts, likes, or friend requests.